9 books plus bags n’ boards for them, about $35 bucks. 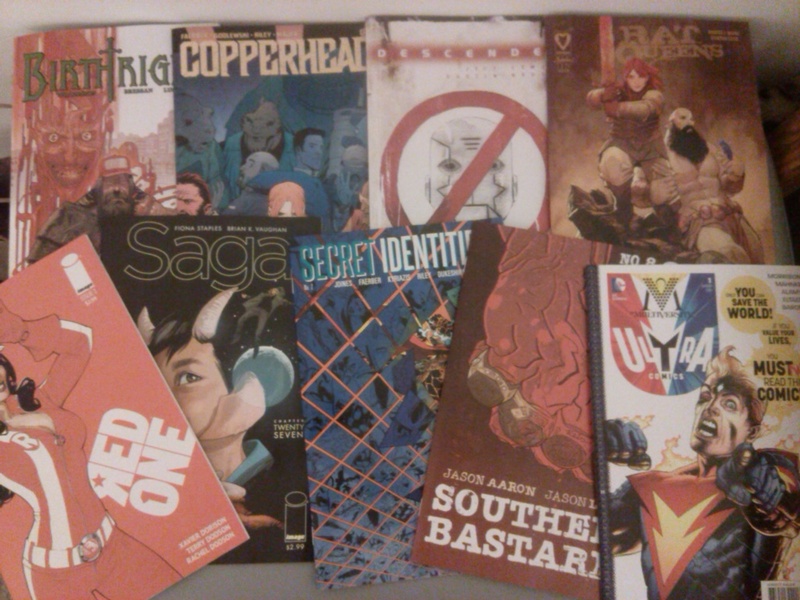 Almost all Image Comics, which is no surprise for me. A few notes: I’m so behind on reading Grant Morrison’s The Multiversity. I’ll have to devote a weekend to it sometime soon. Birthright and Copperhead are both starting their second arcs. I’ve heard great things about Red One, and I’m stoked to close out the harrowing “Gridiron” arc in Southern Bastards. Descender started out strong last month. I still need to read Secret Identities (I’ve only read a 5-page preview so far). And finally, this might be my last issue of Rat Queens I’m sad to say. My last few trips to the LCS have left me a bit bummed because there are so many other books I’d love to be collecting, but for all the usual reasons it’s just not a possibility. Boom! Studios, Dark Horse Comics, Black Mask and others have been making really solid plays in the indie/creator-owned game that’s dominated by Image Comics. For the discerning comic book fan who largely doesn’t read superhero comics, we’re in a golden age of diverse options to chose from in the marketplace, niche as it is in these modern times.